Legal Highs Changing The Face Of Substance Misuse In The U.K. It used to be when you talked about illegal drug use in the United Kingdom, you were talking about weed, cannabis, hashish, coke, snow, whiz, amphetamines, speed and heroin. The risk, dangers and effects of these substances were widely known. However, in recent years, we are seeing the increased use of what are called “legal highs.” In is not against the law to buy these substances in head shops or at festivals. They are often sold as “not for human consumption,” which means they are not yet controlled under the Misuse of Drugs Act 1971. Research is ongoing, and decisions are being made on whether they should be made illegal with some already classified A, B, based on their potential harm. In the past, the government banned certain chemical compounds in legal highs. However, dealers have kept in front of this by removing or changing the chemical structure and re-marketing the substance under different names. To combat this, authorities are now looking at banning a range of compounds that should make this more difficult. The effects of legal highs are meant to mimic the illegal substances, but can be very unpredictable. 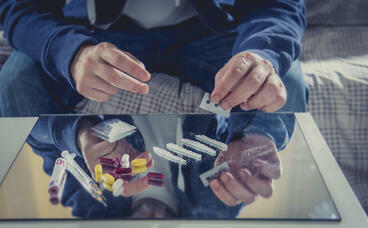 Many actually contain traces of the illegal substances, as well as more dangerous chemicals. Because of the legal-high title, many young people are of the belief that these substances present no risk to them. This misconception could not be further from the truth. Just because a drug is legal to possess, it certainly does not make it safe as it may not have been tested for human consumption and research about short- and long-term risks, and dangers may be limited. M-Cat, or mephedrone, is one such substance that has hit the streets of Britain over the past five years or so. It was initially sold as a plant food and carried the “not for human consumption” warning. Although M-Cat has only been around for a relatively short period, we have seen the impact on individuals and families in various ways. From aggressive young people, stealing from the family home and selling valuables and household goods, family breakdown and parents left wondering where they went wrong to health issues such as damage to the lining of the uterus and constant visits to the toilet. So how have legal highs changed the approach of family-based treatment providers like MST? Be able to identify drug-using behavior by watching out for any changes in their child’s behavior. Are they coming home late, hanging around with peers who use drugs, asking for more money, binge eating or not eating, exhibiting irregular sleep patterns, making more phone calls, sending more texts? Increase supervision and monitoring around the home. Encourage them to be on the lookout for drug paraphernalia (tin foil, plastic bottles—possibly scorched or burnt—rolling papers, bongs, pipes, cigarette papers, small plastic bags, all used to make deals, grinders, rollers) and any unusual smells. Suggest they check the bedroom, clothing, bags, etc. Monitor the money the young person has and spends. Increase supervision and monitoring when their children are out and about. Who are they with? Where are they going? Making sure they are going where they have said. Vet peers. Follow them on Facebook. Check their phone calls. Insist they keep in contact when out. Have more contact with the parents of peers. This includes keeping lines of communication open if there is evidence of drug use. Set clear expectations about appropriate behavior, friends, curfew and acceptable activities. Find ways to fill the young person’s time with healthy, “pro-social” activities that are structured with adult supervision. Use appropriate consequences for any substance use, e.g. household chores, grounding, making it clear to them why they have given the consequence and reinforcing that this behavior is not acceptable. Increase their own knowledge about substance use, what is currently popular among young people, what are the symptoms of use, and risks and dangers (see links below). Be open and supportive, talking about the possible consequences of substance use such as any risk to their health, impact on other family members or legal action that could occur. Talk to the young person at the right time about any evidence of use. Remain calm, and let them know you are there to support them, explain that the behavior is not acceptable. The drugs scene is an ever-changing environment as some drugs fade from favor and new drugs replace them, what is being used in one area may be unheard of in another. It is important for professionals to have some knowledge of current drugs trends and to gather as much information as possible. Here are some helpful links in the UK and in the US. Colette Beatson, MST Supervisor and John Cooper, MST Therapist, from the Barnsley MST Team, in the UK.